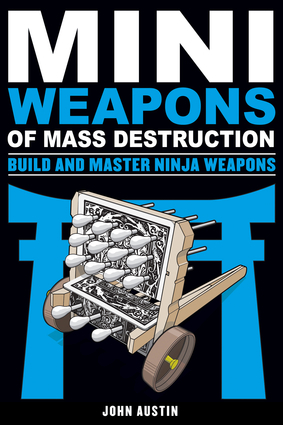 Mini Weapons of Mass Destruction, ISBN: 9781613749241 - available from Nationwide Book Distributors Ltd NZ. To become a ninja master, you need discipline, a silent footstep, and an impressive personal arsenal. Author and toy designer John Austin provides step-by-step instructions on how to turn everyday household and office items into 37 different ninja weapons for the modern era, including: the Crouching Tiger Catapult, Paper Clip Grappling Hook, Origami Boomerang, Magazine Nunchucks, Craft Stick Katana, Pencil Top Eraser Dart, and more! Once you’ve assembled an armory, the author provides several targets to practice your shooting skills—nested paper cups become a dragon; chopsticks and a paper plate form a tripod bulls-eye, and more. Armed, trained, and shrouded in black, you are now prepared for missions of reconnaissance and sabotage and other grim errands.